Robert Bednarik for his helpful comments. The traditional inhabitants of the Dampier Archipelago and the adjacent mainland, the Yaburrara, called its largest island Murujuga, or “hipbone sticking out.” The islands lie just off the coast of the Pilbara region of Western Australia and south of the islands of Java and Timor. The chain of 42 islands contains an immense, uncounted number of ancient petroglyphs, known in the local language as marntakamani. The Ngaluma—as groups of the Pilbara region who share the same language and culture are collectively known—believe the petroglyphs were created by margas, ancestral beings that formed the landscape during the creation period. The stone engravings depict an enormous range of images, including land, air and sea animals, various representations of human forms, and geometric figures. Complex panels depict humans engaged in a variety of secular and sacred activities, and many motifs remain connected to the beliefs and practices of the Aboriginal people today. Up to one half of the rock art is considered sacred. Patterns of weathering on the petroglyphs indicate they were created over a long period of time, and the oldest may date back more than 10,000 years, making it comparable to the Paleolithic art of Western Europe. The estimated number of Dampier rock art images ranges from 300,000 to more than 1 million. Aboriginals also erected standing stones to mark the presence of natural resources or of thalu, sites of rituals traditionally performed to increase a particular animal or plant species. The Yaburrara were keepers of these sacred sites and other Ngaluma would visit the islands for ceremonies. Anglo settlers renamed Murujuga and its accompanying islands after William Dampier, the first European to land on the archipelago in 1699. In the 1860s the area became a center for whaling and pearling, leading to the exploitation of Aboriginals and Malays as forced labor. A smallpox epidemic in 1866 claimed many Aboriginal lives. In 1868, a white police officer raped an Aboriginal woman and then arrested her husband for allegedly stealing a bag of flour from a pearling boat. The officer chained the native man to a tree for the night, and while he and his assistants slept, a group of nine Yaburrara men attacked, freeing the prisoner but killing the police officer and three companions. Several days later a group of white men, who were sworn in as special constables to track down the accused murderers, attacked the main Yaburrara camp, killing dozens, including women and children. The killing continued over several months as government forces chased fleeing Yaburrara from island to island. Official reports at the time claimed that only a few people were killed, but eyewitness accounts and the later discovery of skeletal remains indicate that at least half of the Yaburrara population of 100 to 200 were murdered. The massacre led to the extinction of the Yaburrara as a distinct group. Beyond the devastation of the Yaburrara community, the massacre had the effect of subduing other Ngaluma groups: in the face of labor exploitation and threats of violence, nearby communities settled quietly onto reserves rather than fight. In 1905, the Aborigines Act forced the Ngaluma to give up their lands and settle in a compound within the mainland town of Roebourne. By this time, pearling and whaling had given way to copper and gold mining on the mainland, and in 1961 iron became a major industry in the area. With this industrial development, the Western Australian government saw the need for a deep-sea port. Depuch Island, which lies east of the Dampier Archipelago, was considered but rejected in 1962 when the Western Australian Museum reported the existence of some 5,000 petroglyphs and recommended their protection. Attention then turned to Murujuga Island, which, ironically, had far more petroglyphs but was not surveyed. The government authorized construction of the port, including a electric power station, an iron pelletizing plant, workers’ homes, and the first of several causeways joining the island to the mainland, which transformed it into a peninsula known today as Burrup Peninsula. Untold numbers of petroglyphs were destroyed during construction, which typically involved bulldozing the rocky terrain into the sea or covering it with fill. Unfortunately, archeological investigation in the Dampier Archipelago did not begin until the late 1960s, when industrial development was firmly established. The Pilbara Study of 1974, a government plan for regional resource development, targeted Murujuga for further exploitation; a report on Aboriginal heritage sites was left out of the final study. Over the following decades, industrialization continued while government and corporate entities conducted archaeological surveys that downplayed the damage caused by development. A long overdue but promising change occurred in 1993, when the Western Australian Department of Conservation and Management completed its first survey in consultation with the Aboriginal community. The results spurred government efforts to find a new industrial site for future development. The study testified to the environmental uniqueness of Murujuga, including 39 species of flora that are rare or unique to the Dampier Archipelago and rare fauna including turtles and humpback whales. In 1996, the government announced plans to develop the new Maitland Industrial Estate, which is on the mainland and has no rock art. However, the government did not follow through, instead investing additional millions of dollars in infrastructure on Murujuga and allowing Woodside Petroleum to expand. In 2005, the government announced it would not develop the Maitland Estate until the Dampier area was built out. Today, the island is an industrial park, with 38 percent of its land occupied or set aside for gas, petrochemical and other industrial facilities run by Woodside Offshore Petroleum Pty Ltd., Methanex Pty Ltd. and Hammersley Iron Co., among others. Industrial impacts on the environment and petroglyphs of Dampier have been enormous. Acidic emissions from petrochemical plants damage both petroglyphs and coral reefs, and the surfaces of the stones are eroded by acidic rainwater. Depending on the scale of new development, scientists estimate that the majority of the petroglyphs will begin to disappear by about 2030. The Murujuga area is Australia’s largest emitter of greenhouse gases—300 million tons to date. Iron pelletizing releases dust, further polluting the air. The Woodside plant contains 92 million tons of explosive ammonium, and together with other industrial facilities, including nitrate stored at Dampier Port, the island holds an explosive potential of 760 kilotons of TNT, equivalent to 58 Hiroshima nuclear bombs. The petrochemical facilities also release thousands of tons of carcinogens into the air every year. Corporate policies and practices have also been damaging. Beyond the destruction that occurred with the initial industrial development on the island of Murujuga, archaeologists employed by Woodside Petroleum in the early 1980s removed 1,760 boulders with petroglyphs and stored them in a compound, causing physical damage as well as spiritual harm by severing their connection to the place where they were created. Australian heritage law puts the developer in charge of a site’s archeological assessment. Thus, very little information from impact studies has been made public and archeologists are frequently required to sign confidentiality clauses. In all, 20 to 25 percent of the petroglyphs on Murujuga have already been lost. Among all the corporations in the area, the Dampier Salt Co. is the only one that has consistently protected the rock art in its territory. In June 2002, growing public criticism culminated in the first local rally to save the Murujuga rock art. Later that year, a report documented the damage done to the boulders removed by Woodside and another report sponsored by Methanex, which has a methanol plant on the island, admitted to high levels of pollution and acidic emissions. In 2003, the nearby city of Roebourne commissioned an engineering report which warned that tidal surges over the petrochemical plants would cause massive explosions. This warning echoes beliefs in the Aboriginal community that the sea will have its revenge on industrial development. One of the most prominent current threats to the Dampier region is Woodside Petroleum’s plan, announced in 2005, to build its Pluto liquid natural gas processing plant on Murujuga in an area with a heavy concentration of petroglyphs. In September 2006, the Western Australian Environmental Protection Authority approved the Pluto plant, and the minister for indigenous affairs, who oversees the protection of the state’s rock art, gave Woodside permission to destroy 150 petroglyph sites for the plant’s construction. In addition, several new petrochemical plants are being planned. The Australian National Trust, the Australian Rock Art Research Association, Aboriginal groups, state political leaders, and others, are campaigning to stop this development and to persuade the government to institute the plan to develop the Maitland Industrial site. In recent years the Aboriginal population—namely, the Ngaluma Yindjibarndi, Yaburara Mardudhunera and Wong-goo-tt-oo—have attempted to reclaim greater control over the Dampier region through Native Title claims. Although the Yaburrara had been considered a subgroup of the Ngaluma, an Australian High Court judge ruled in 2003 that because the Yaburrara were extinct, there were no direct inheritors of the land; thus, the land title belonged to the state and not to other Ngaluma groups. However, a pending case before the National Native Title Tribunal has pressured the state government to offer financial compensation and economic concessions to the local community. In the wake of recent desecration—particularly the discovery in 2004 that 98 of a collection of 138 sacred standing stones had been knocked down or destroyed—the Aboriginal communities have also sought to renew traditional custodianship of their cultural and ceremonial sites in the Dampier Archipelago. The Australian Rock Art Research Association, founded in 1983, has been working to study and preserve the rock art of the Dampier and to assist the Aboriginal population in its efforts to regain custodianship. Recent years have seen increased efforts to formally protect the wider Dampier region, because only a few select sites are designated as protected areas under the Aboriginal Heritage Act. Of great concern is the preservation and management of the cultural landscape and heritage as a whole, rather than piecemeal protection of individual sites. Groups like the National Trust argue that the area needs a complete inventory of heritage sites and a single management plan. In 2004 and 2006, the World Monuments Fund placed the Dampier region on its annual list of 100 Most Endangered Sites of the World. For years, conservation groups have urged the Western Australian government to nominate the Dampier region to the UNESCO World Heritage list, but the government has refused. 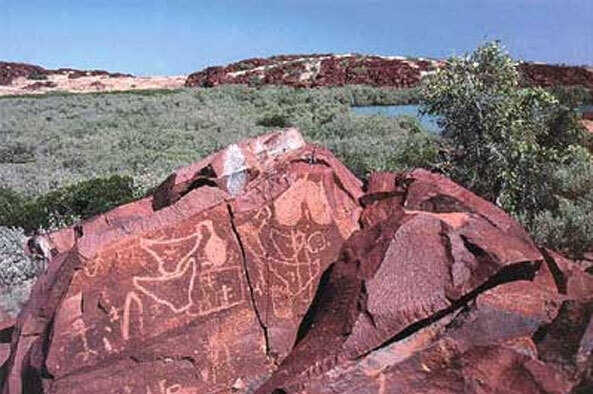 In 2004, the Dampier Rock Art Precinct—including Murujuga, the other islands of the Dampier Archipelago, and the Dampier Coast—was nominated for placement on the Australian National Heritage List. The Australian Heritage Council completed its assessment of the site in August 2006, and recommended that it be added to the list. The Western Australian government, however, voiced clear opposition to the site’s listing, citing “grave consequences” for the state’s economy, leading the federal environment minister to defer a September 2006 decision deadline. Yet public pressure, including a major petition drive, led Woodside Petroleum to announce on November 27, 2006, that it had reversed its opposition to the National Heritage listing, with the caveat that the 6.8-kilometer area it is considering for its Pluto facility be excised from the proposed protected area. The state government dropped its opposition the following day. The environment minister’s decision on the heritage listing is expected in early 2007. Sign a petition to the government of Western Australia asking it to halt further development on Murujuga (Burrup Peninsula) and to establish a management plan to protect the rock art. Request that the state government turn the Burrup Peninsula into a national park, consult and negotiate with its traditional owners, and nominate the island for the UNESCO World Heritage Site list. There is no reason to further develop Murujuga when the mainland site of Maitland is ready to accomodate an industrial estate. Bednarik, Robert G. “Save Dampier rock art.” Australian Rock Art Research Association. World Monuments Fund. “World Monuments Watch, 1996-2006.” World Monuments Fund. Dampier Archipelago Rock Art Precinct. Laurie, Victoria. “Burrup treasure is history in the taking.” The Australian, October 31, 2006. Longley, Griffin. “Gas v. art; civilizations collide in WA’s North-West.” The West Australian, September 30, 2006. National Trust of Australia (WA). Archeology and Rock Art in the Burrup Peninsula. Australian Heritage Council. Assessment of the heritage values of the Dampier Archipelago. August 2006. Bednarik, Robert G. “Australian Apocalypse: The Story of Australia’s Greatest Cultural Monument.” Australian Rock Art Research Association, May 2006.